With winter break just around the corner, summer seems like a lifetime away. However, there’s no harm in dreaming about your summer plans now. Whether you’re an adrenaline junkie, or looking to contribute to a community, or even if you’re seeking something new, there’s a summer program out there that will fit your needs. Why spend your summer days playing Fortnite and watching Netflix when you can go and create your own adventures? Rustic Pathways even includes a “Mystery Trip” for adrenaline junkies where the destination is unknown until you arrive for your flight. 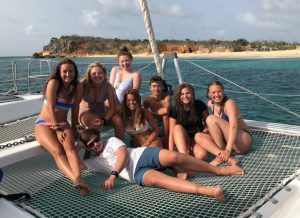 Broadreach has many more trips specific to different interests, including advanced scuba, animal science, Caribbean voyages, language, marine biology, medicine, photography and media, and sailing. “I would recommend going because it opens up the possibility of diving during vacation, you make new friends, you bring back new experiences, and if none of that entices you, you will come back four shades darker,” said Whitney. The Summerfuel Program is aimed toward students who want to be involved in pre-college studies and/or business and entrepreneurship classes while still being immersed in a new culture. It offers adventures for students who want to be involved in cultural exploration specifically in France or Spain. “I went on this trip the summer after junior year because I really wanted to go to Spain and meet cool people from all around the world,” said senior Avi Arora. “The only downside from this trip is that I didn’t get all the freedom I was expecting, but I did learn a lot in the classroom and had so much fun with friends exploring Barcelona.” While in Barcelona for three weeks, Arora took Spanish classes on the weekdays and marketing and advertising classes twice a week. Another program called Putney allows students to continue studying abroad, while also hosting trips exclusively for community service and language learning. The program called Where There Be Dragons allows students to develop “cross-cultural competencies and an understanding of critical global issues through experiential learning,” according to their website. It offers programs in India, China, Africa, Latin America, Southeast Asia and more. Another program, Travel for Teens, differs from the others because although many of these programs include ninth through 12th graders, Travel for Teens hosts trips exclusively for older teens during the summer following 11th and 12th grade. West Coast Connections, another popular program, allows students to go on a trip anywhere for seven to 40 days. And if you’re not looking to travel internationally, this may be a great program for you. In addition to its international adventures to Europe and Australia, the program offers trips to California, the Grand Canyon, Alaska and Hawaii. Senior Leah Mautner went to Fiji with Rustic Pathways. “The summer programs are amazing because they are a great way to spend your summer and have the chance to explore new ideas and activities you would never have the opportunity to encounter otherwise,” she said.